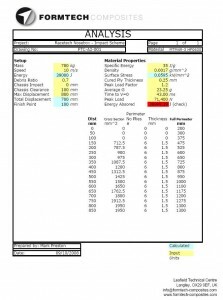 The following case study was written for an article in a motorsports magazine and takes the reader through the typical stages of designing a nosebox for a Formula One car. 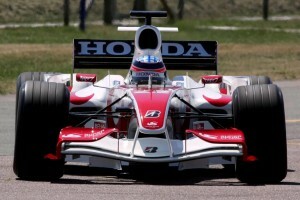 The nosebox is the part of the car that connects the monocoque to the front wing. The nosebox has to take a number of loads: front wing loads of around 500 kg and the crash loads that it is subjected to in the FIA’s required homologation crash tests. The calculations for this nosebox were done with 10 m/s or around 36 kmh and a weight of 780 kg for the chassis. With these two numbers we can calculate the energy of the impact in joules (J). The carbon fibre that the part is made of has a very high energy absorption capability which makes the structure both light and strong. 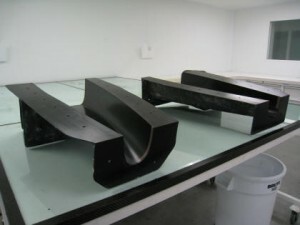 Using test pieces, Formtech Composites will characterise a number of standard lay-ups of carbon fibre which will provide standard energy efficiency values that can be used in the analysis and design of a nosebox shape, size and layup. Using the moulds shown the laminate is laid up into the two halves in the clean room. 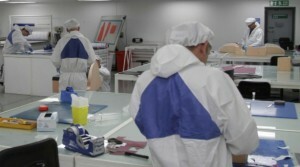 The clean room has a positive pressure supplied through the air conditioning system in order to keep the dust out and produce a high specification part. 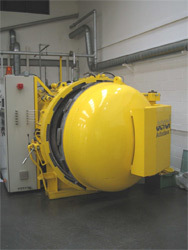 Once the part has been laid up in the clean room, it is bagged up and put into one of the two large autoclaves that Formtech uses for processing the composite parts. 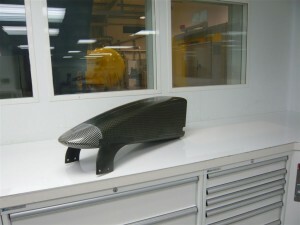 The final product is shown with the front nosecap bonded on and the pylons to hold the front wing. 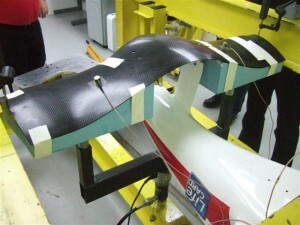 This picture shows the wing being proof tested before running on the track with over 500 kg of downforce on it.